Manfred Honeck is one of a growing number of stars among today’s new generation of conductors. Honeck, music director of the Pittsburgh Symphony Orchestra for the past five seasons, has inherited the mantel previously worn by such conductor titans as Fritz Reiner and William Steinberg. The PSO’s distinguished history is rooted in its mastery of the Romantic era repertoire, in particular works by Austrian and German composers. Strauss offers a program tailor-made to exploit this longstanding musical relationship. This FRESH! hybrid SACD is Reference Recordings’ first release in their Pittsburgh Live! series with more recordings scheduled for release at the rate of two per year. Don Juan, Op. 20 (18: 33): The rakish nature of this womanizing scoundrel is depicted with references to his dalliances and concludes with his damnation and death. Death and Transfiguration, Op. 24 (26:18): A man on his death-bed recalls memories of his youth before the ultimate acceptance of his fate, and his soul’s passing on to eternity. Till Eulenspiegel’s Merry Pranks, Op. 28 (14:35): This German folkloric character and inveterate prankster thumbs his nose at those whom he angers until he gets his eventual comeupance on the scaffold. It is gratifying to hear music made by an orchestra that has obviously worked long and hard with its conductor with everyone literally and figuratively on the same page. 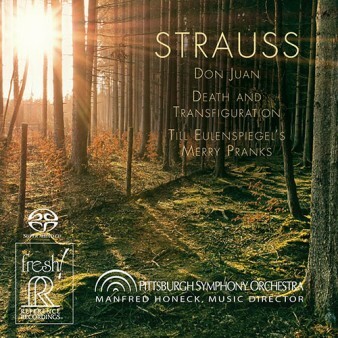 Strauss’s big orchestral sound pictures run the risk of getting bombastic treatment when placed in the wrong hands. Fortunately, maestro Honeck avoids such traps and delivers fleet renditions of these pieces, bringing out instrumental details that are often submerged in other performances. Again, Honeck’s commentary indicates that deliberate changes were made in the scores to underscore some points that he considered important. One such musical alteration is the raising, by one octave, of the “distorted” note on the D-clarinet at Till Eulenspiegel’s trial so that it can be heard over the full orchestra. These performances in the PSO’s historic Heinz Hall were recorded from June 8 to 12, 2013 by the Soundmirror team (Mark Donohue, John Newton, and Dirk Sobotka) using five omnidirectional DPA 4006 microphones, supplemented with other mikes as needed. The final tracks were laid down at 64fs DSD on a Pyramix workstation. Technical details aside, this is a most natural sounding orchestral recording with the sonic perspective of a mid-orchestra seat (the best in the house). We get the full bloom of all of the orchestra’s sections. Bass, and there is plenty of it in these blockbusters, is full but not bloated. Those listeners who are fixated on hearing pages turn, seats squeak, or unnaturally highlighted solo instruments, need not apply. This is simply orchestral sound that is warm and full-bodied. I listened to all of the formats encoded on this disc, 2-channel HDCD, 2-channel SACD and multi-channel SACD. How did I vote? All versions sounded superb but for the full orchestra-in-the-house effect, the multichannel SACD gets the nod. Reference Recordings provides their usual high quality program booklet with the above-mentioned essay by maestro Honeck and a brief history of the Pittsburgh Symphony Orchestra. This latter piece is important because RR has more PSO recordings in the pipeline. These Strauss tone poems have been performed frequently and not necessarily to their best advantage. One would have to time travel back to the Fritz Reiner/Chicago Symphony Orchestra era to get the echt renditions of these pieces. Fortunately for those listeners who were not around in the 1950s, Honeck and colleagues do a wonderful job in conveying the essence of each work. Those who have preconceived notions of how Till, Don Juan and D&T should sound would do well to park their prejudices at the door and just listen to these magnificently played and recorded performances. 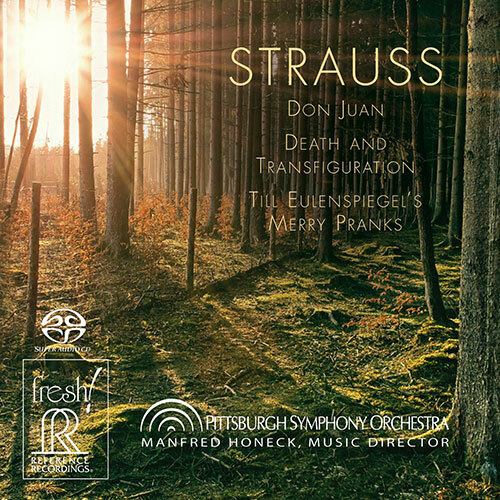 Strauss is indeed an auspicious start for what promises to be a splendid orchestral series, particularly if its successors maintain its high production values.